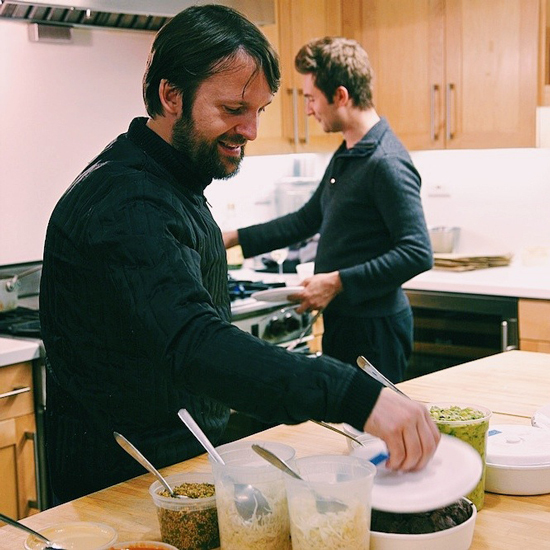 René Redzepi has had an action-packed visit to New York City. He’s drunk cocktails at 10 a.m. at PDT, courtesy of F&W contributor Jim Meehan. He’s hung out with the city’s collective food media at a lovely cocktail party at Tasting Table. And best of all, he came to the Food & Wine Test Kitchen, where he read from his awesome new book, A Work in Progress. (It’s a set of three books that spotlight a year at his Copenhagen restaurant, Noma—a book of Instagram images, a book of recipes and a journal printed on graph paper—all held together with a super-stylish giant yellow rubber band; it’s $60 and it’s worth every penny.) Redzepi chose an anxiety-filled journal entry from late August, when his hero Michel Bras came to eat at Noma. We knew Redzepi was eating well in New York. But we wanted to be good hosts, and we knew he was on a taco kick. So we got Alex Stupak to bring a terrific spread from his restaurant Empellón Taqueria for Redzepi and Noma chef Lars Williams, featuring just-made tortillas, short rib pastrami, carnitas and Stupak’s crazy-good smoked cashew salsa. “Oh, man, Alex f***ing Stupak,” said Redzepi, who reminisced about losing his taco virginity (“a special moment for me”), the need for good tacos in Denmark (“tacos are uncharted country for us; they taste like cheap flour and raw dough”), and his attempts to make Mexican food when he was there on vacation (“I wasn’t so good; this old woman, she was 1 meter tall, she made me look ridiculous”).